Daredevil, you have what in your glove? Silver Age Daredevil was something of a blind MacGyver in tights. He made his own stuff, whether it was sewing his own costume (by hand, no less) or inserting micro-circuitry into his billy club. 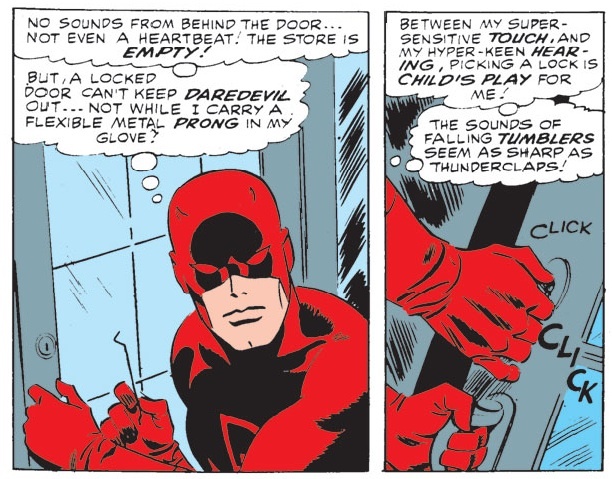 However, the panel below, from Daredevil #19, by Stan Lee and John Romita, makes me worry for his safety. If he’s got sharp pieces of metal wire in his glove, what other pieces of random paraphernalia does he carry around on his body? Sand paper in his underwear? Note also his usual Silver Age habit of bragging to the readers about his expertise in whatever happened to be the requisite skill of the issue. Picking locks? I’m not so sure I’d be bragging about that one. It is still essentially a bit of wire in a glove.